Today's Feel Good Friday is all about an organization called Year Up. Why? Because on Monday, an intern from Year Up will be coming to work in my office! 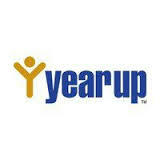 Year Up, was founded in Boston, Massachusetts in 2000. It's an organization whose slogan is "closing the opportunity divide". And just what is that divide? As explained on the front page of their website, "6 million young adults are disconnected from stable career pathways" and "12 million jobs requiring post-secondary education will go unfilled in the next decade." "Year Up's mission is to close the Opportunity Divide by providing urban young adults with the skills, experience, and support that will empower them to reach their potential through professional careers and higher education." In a single year. They do this through a mix of training. Six months of technical and professional skills training taught in the classroom followed by a six month internship with one of Year Up's corporate partners. Throughout the program, students earn college credit, receive a weekly stipend and get the support of staff advisors, professional mentors and a dedicated social services staff. You can learn more by watching this video. Results are dramatic. Of the 14,000 young adults who have been through the program since it's inception, "85% of graduates are employed or enrolled in postsecondary education within four months of completing the program" and "over 90% of corporate partners would recommend the Year Up program to a friend or colleague." There are locations throughout the US, including Year Up Bay Area, and many ways for you to get involved. Share this information with a student you know, become a mentor, or make a donation. I'm looking forward to meeting our Year Up intern on Monday and to staying in the loop with the program by liking their Facebook page and following them on Twitter @YearUp and @YearUpBayArea.